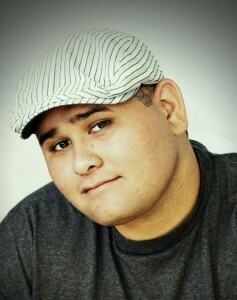 Honolulu designer John Garcia has been named one of ten finalists in a groundbreaking social media campaign by Audi. He moves onto Round 2, which kicks off on Monday, and with the help of the Hawaii social media community, he and his supporters could win $25,000 for charity. I was eager to find out how everything came together. And although John was already deep into brainstorming and developing his strategy, he was kind enough to take some time for an e-mail interview. The automaker kicked off its multimillion dollar “Luxury Has Progressed” campaign with a widely lauded Super Bowl ad on Sunday. And while John surely didn’t expect to be picked as a finalist, he knew what Audi was up to well before the big game. 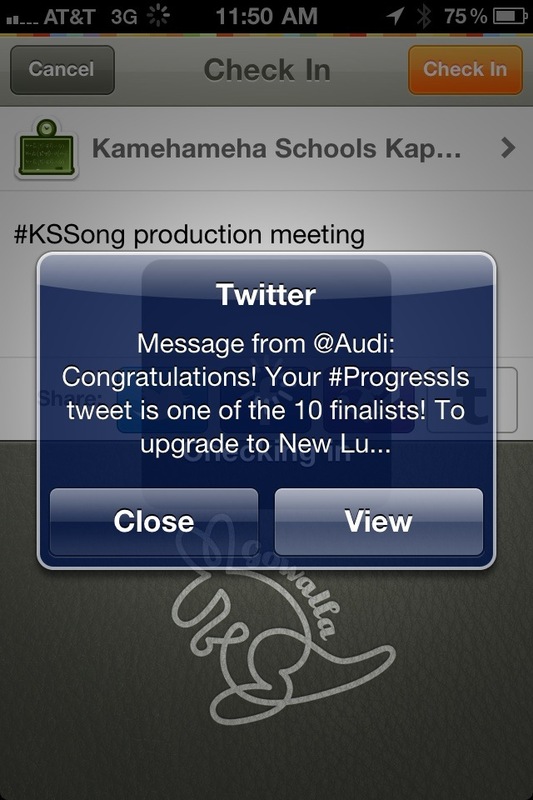 As Digital Innovation Strategist at Kamehameha Schools, he took note of reports that Audi was going to be the first company to include a Twitter hashtag, or topic keyword, in a Super Bowl commercial. Using the “#ProgressIs” hashtag entered people in a contest to win a trip to Sonoma County in California to test drive an Audi R8, and to have $25,000 donated to charity on their behalf. In fact, John posted his winning Twitter entry on Friday, two days before the Steelers and the Packers faced off. John says it took a few minutes to come up with the message, and while complementary, it came from a personal connection to the company. The Super Bowl, and Audi’s Super Bowl ad, came and went. John says he wondered how many people even knew what the hashtag meant. On Wednesday, he got the good news. Fittingly, the team behind Audi’s social media campaign used social media to get in touch. John says he was shocked, especially since he’d brought up the campaign last week, and even told his coworkers that he’d entered. “To be chosen as a finalist, I couldn’t make that up,” he says. He checked with Audi to see if he could tell people about being a finalist, and he got a response right away that it was fine. So he did, impressed with Audi’s efforts to date. After the initial excitement subsided, John started to look into who the other winning Twitter users were. “I started to notice a pattern in those who were being chosen: highly active social media users with large followings,” he says. Though he hadn’t heard of most of the finalists, he saw that @ChrisHusong was also moving on to Round 2. It became clear that he was up against several “social media heavy hitters,” and simply by the numbers, John says that some might prematurely count him and his 4,200 followers out. “This will be a good test to see how engaged my followers are and how willing they are to spread the word on my behalf,” he admits. But his supporters could surprise everyone. John says he is a believer in the power of the “coconut wireless,” both conventional, and digital. The next phase of the contest kicks off early in the morning on Valentine’s Day, and wraps up on Friday, Feb. 18. Are those five days enough to get the support of Hawaii’s Twitter community? “I’m confident that with the right messaging and plan in place, we’ll be able to unify our efforts and give the competition a run for their money,” John says. To win Round 2, he must develop a Twitter campaign around a photo and a hashtag that must garner the most views. John says won’t unveil his campaign until 7 p.m. HST on Sunday (or midnight on the East Coast), but he’s already given out some hints. He’s started posting to Twitter with the hashtag “#VoteForProgress,” for one, asking people to name their favorite charities. And he’s registered VoteForProgress.org, where he says he’ll post all the details, including easy ways to help him spread the word. “I have a plan in the works that I think might allow me to use this experience as a spring board to greater good,” he says. Great job John, way to put a local boy from Hawaii in a major ad campaign. Cool John! Congrats and hope that you can win this thing! Mahalo, Shanna! Three more days to go! Good luck, John! We’re all here supporting you! Wanted to thank each and every one of you for the support. It’s been a long week — I hope we pull this out.